A salmon in Alaska makes an unlikely journey on "the Mount Everest of rivers" - the Susitna - as residents consider the costs/benefits of a government-proposed mega-dam. An infectiously funny and enjoyable environmental documentary. It’s a bird, it’s a plane, it’s…the Super Salmon? Not your typical superhero, perhaps, but this singly courageous king salmon is at the centre of an incredibly touching short. Director Ryan Peterson has created an environmentally-minded social-issue documentary that is whimsical and fun by injecting the 25-minute film with so much passion, personality, and humour that it’s hard not to feel the love bursting through it. 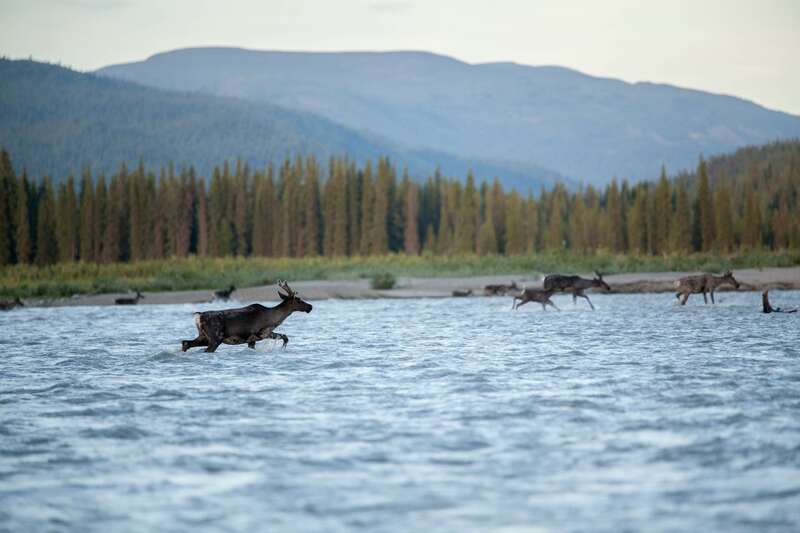 As plans for building the second tallest dam in America are underway, The Super Salmon reveals the local residents’ concerns about the consequences of constructing the outdated megastructure on the Susitna River in order to meet Alaska’s need for renewable energy. Interjected is the story of Fish 241, also known as the Super Salmon, which has made an incredible journey on “the Mount Everest of rivers,” dodging hungry seals and braving icy waters. It is a journey that, activists argue, would never happen if the proposed dam is erected. The film is remarkably thorough in laying out the issues at hand, and is admirably even-handed in its presentation of the two sides. Despite the serious issues it tackles, however, the film is a hoot. Grandiose classical music punctuates its score, while quirky animation (courtesy of frequent SOTW-featured filmmaker Drew Christie) playfully illustrates various nuances, and conspicuous jump cuts and comical interview moments make for an unquestionably likable documentary. The people featured in this film are likewise irresistible. Snippets of their unscripted lives are charming, but they are a formidable community when they come together. Initially, Peterson wanted to create year-long timelapses of the Susitna River, to document its natural flow regime in the event that the dam was built. But after he met Molly and Mike Woods, he says, “a proper film popped out of the ether.” The charismatic couple bring the film to life as the director draws out both the passion and love they share for their homeland and for one another. A fisherman and an activist, Mike shines with hugely infectious energy and determination when he explains what it would mean to him if the mega-dam were to be built. “It would be like watching my very best friend die of cancer….That’s not an option. [You’d] fight the hell out of this, so that’s what we’re going to do,” he says with tears in his eyes. His devotion and pride are shared by the other local residents who take part in the film, and when all 25 minutes of the film have flown by, you’ll find yourself cheering them on, inspired and deeply moved by their fighting spirit. The film is supported by the outdoors outfitter Patagonia, a company which has been unusually active in the short film space in recent years. They’re especially passionate about dams, having produced a full length documentary on the subject a couple of years ago called Damnation, so the partnership here seems fitting. After working together on The Super Salmon, Peterson and the Woods remained close, and the trio are now in their third year of running a sustainable, fishermen-direct salmon fishing business together. And, for those inspired by the doc and want to help the cause, you can find out how to get involved with the Susitna River Coalition.